In what some refer to as a ‘post-truth’ society, it is unfortunate that the role of scientific results is frequently questioned in politics today. Inevitably, debates will creep in over investing scarce public funds in more academic work: Can research really be an effective pathway to real-world benefits? Aren’t there more worthwhile ways to achieve political goals? In such times, it is important to stand up for science and research, and the important impacts these can — and must — have in the short and long run. There is simply too much at stake for contemporary political opportunism. Against this backdrop, it is my pleasure to give you an update on important research being carried out by CIFOR and its many partners. 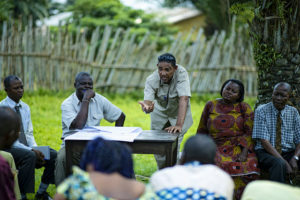 The CGIAR Research Program on Forests, Trees and Agroforestry (FTA) is the world’s most ambitious international research program in its field. In 2015, over 200 FTA researchers produced more than 600 FTA publications, of which 80% are open access. More than 50,000 people were trained, and very large audiences have been reached through the program’s events, websites and social media. Since 2011, FTA has delivered research and made a difference for landscapes, livelihoods and governance in all regions. Integrating gender aspects in all research. These are only some of FTA’s areas of work, where research has an impact on the lives of the most vulnerable and disadvantaged. These achievements would not have been possible without a solid partnership between leading forestry research organizations. The Center for International Forestry Research (CIFOR) leads the program in partnership with Agricultural Research for Development (CIRAD), Bioversity International, Tropical Agricultural Research, the Higher Education Center (Centro Agronómico Tropical de Investigación y Enseñanza, CATIE), the International Center for Tropical Agriculture (CIAT) and the World Agroforestry Centre (ICRAF). In the next phase, Tropenbos International and the International Network for Bamboo and Rattan (INBAR) will join. And, importantly, many generous donors are supporting our work. We are now gearing up for phase 2 of FTA for 2017-2022. The CGIAR System Council has approved the next six years of FTA within a CGIAR portfolio of programs critical to food security, natural resource management and sustainable development. This means that partners and donors are confident that FTA will continue to produce highly relevant research results. Our budget is about USD 80 million per year, to ensure that FTA can continue to deliver scaled-up impact for livelihoods and landscapes worldwide. Climate change mitigation and adaptation opportunities in forests, trees and agroforestry. Governance hypothesis: Public and private governance arrangements and institutions must be transformed and aligned to create the necessary enabling environment where forests, trees and agroforestry systems can fully contribute to achieving the Sustainable Development Goals (SDGs). Livelihood hypothesis: There is scope for investments to achieve major increases in income, food and nutrition security, and resilience for at least 100 million people in the face of climate change. This includes more inclusive and gender-equitable access, improved management and better utilization of forests, trees and agroforestry systems. Trade-offs hypothesis: Maximizing benefits among diverse stakeholders at scales from the farm to the globe requires understanding and actively managing trade-offs between the production of food, fiber, energy, water and other ecosystem services, climate regulation and the maintenance of biodiversity from forests and trees in landscapes. So we are in for an exciting next phase for FTA! I would like to take this opportunity to introduce the new FTA Director Vincent Gitz who will join us in November 2016. Vincent brings solid experience from international forestry, agriculture, land use and food security, including from the Committee for World Food Security, where he coordinated the High Level Panel of Experts on Food Security and Nutrition — highly relevant experience for taking on the complex coordination of FTA. He takes over from Robert Nasi, who has championed FTA since its inception and is now moving on to head up all of CIFOR’s research. The Forests, Trees and Agroforestry program is made possible by a large and dedicated team of researchers and professionals, and by many funding partners trusting us with their resources. As we enter the next phase for FTA, our eyes are fixed on progress toward sustainable development in the world’s landscapes.